I have never heard of “corn cakes” before, but these sounded great! They are essentially a corn “pancake”, but also remind me of a fritter. We absolutely LOVED this recipe and they are a great side dish to grilled chicken or a grilled meat during the summer. These come from Southern Living’s “Farmers Market Cookbook”. Cut corn off the kernel. Pulse with eggs, milk, and butter in a food processor 3 to 4 times or until coarsely chopped. 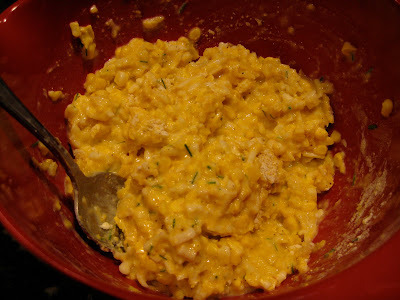 Combine flour, cornmeal, cheese, chives, salt, and pepper in a large bowl. Stir in corn mixture until dry ingredients are moistened. Spoon batter onto a hot, lightly greased griddle or nonstick skillet. Cook for 3 to 4 minutes, flip, and cook another 2 to 3 minutes. 1. Pulse first 4 ingredients together in a food processor 3 to 4 times or until corn is coarsely chopped. 2. Stir together flour and next 5 ingredients in a large bowl; stir in corn mixture just until dry ingredients are moistened. 3. Spoon 1/8 cup batter for each cake onto a hot, lightly greased griddle or large nonstick skillet to form 2-inch cakes (do not spread or flatten cakes). 4. Cook cakes 3 to 4 minutes or until tops are covered with bubbles and edges look cooked. Turn and cook other sides 2 to 3 minutes.